Spray the inside of a large slow cooker with cooking oil spray. Place the onion, apple juice and pork in the slow cooker and add the seasoning mix from the taco kit. Spread the chipotle paste over the pork. Cover and cook on high heat setting for 5-6 hours or until the pork is very tender. Make the salsa by combining all the ingredients in a bowl. Cover and chill in the fridge while the pork is cooking. Remove the pork from the slow cooker and leave to rest for 10 minutes then shred with 2 forks. Place the pork in a bowl and add about 125ml of the hot cooking liquid to the shredded pork. Heat the tacos following the pack instructions. 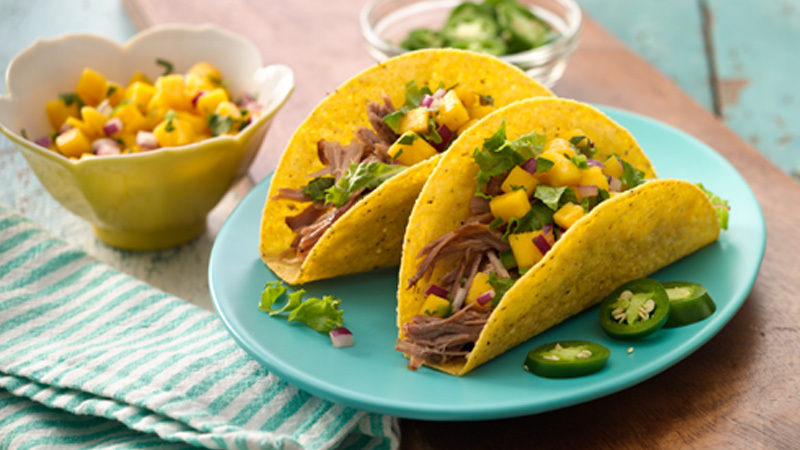 Pile the shredded pork into the tacos and top with some of the mango salsa and shredded lettuce. Serve with the rest of the salsa and with sliced green chillies.